Egypt Freezes Assets Of 5 Prominent Human Rights Defenders : The Two-Way These human rights defenders are accused of using foreign funding to destabilize the country – while they say they were simply carrying out normal human rights work. It's part of an ongoing crackdown. 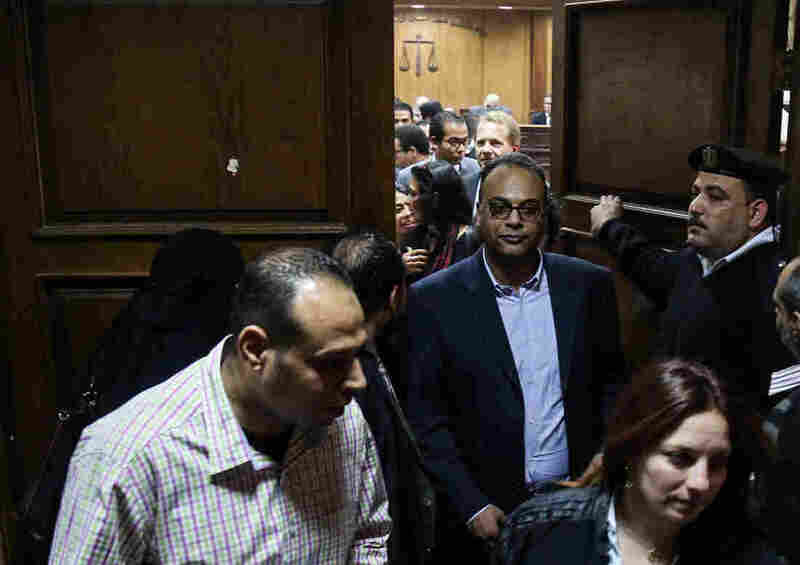 Investigative journalist Hossam Baghat (center), who founded the Egyptian Initiative for Personal Rights, leaves a courtroom at the Cairo Criminal Court in March. A Cairo criminal court has ruled today to freeze the assets of five prominent human rights defenders — another step in the ongoing crackdown against the government's critics. Those impacted are investigative journalist Hossam Bahgat, who founded the Egyptian Initiative for Personal Rights; Gamal Eid, the director of the Arab Network for Human Rights Information; Bahey el Din Hassan, founder of the Cairo Institute for Human Rights Studies; Mostafa al-Hassan, director of the Hisham Mubarak Law Centre; and Abdel Hafiz el-Tayel, director of the Egyptian Center on the Right to Education. The organizations involved are cornerstones of the Egyptian human rights community, which is finding it increasingly difficult to operate amid increasingly repressive measures from the government of Abdel-Fattah el-Sissi. These human rights defenders are accused of using foreign funding to destabilize the country – while they say they are simply carrying out normal human rights work. The decision freezes their personal and organizational bank accounts, according to Amnesty International, though it adds that the "status of EIPR and ANHRI's assets remains unclear." They could face prosecution and up to 25 years in prison. "Egyptian authorities are single-mindedly pushing for the elimination of the country's most prominent independent human rights defenders," said Sarah Leah Whitson of Human Rights Watch, calling the proceedings "repression cloaked in the guise of legalistic procedure." The ruling is one part of a planned criminal prosecution against human rights workers and organizations, and is provisional ahead of a final verdict. The case was first opened in 2011 – and the list of the state's targets continues to expand. Over the past three months, according to the Egyptian Initiative for Personal Rights, the case's investigative judges "have issued at least four new travel bans (bringing the total up to 12), added a further 9 individuals to the asset freeze trial (bringing the total up to 13) and summoned at least 5 further NGO staff for interrogation (bringing the known total up to 17 human rights defenders interrogated about their human rights work)." The organizations impacted today are vowing to continue their work. EIPR called on "political forces and popular movements that believe in the values of freedom and social justice to stand in solidarity with the Egyptian human rights movement and make every effort to ensure the movement can continue to play its vital role" in a statement after the ruling. Sissi and the military-led government launched this sweeping crackdown after the 2013 ouster of democratically-elected Islamist President Mohammed Morsi. Under the auspices of fighting terrorism, the government first targeted Morsi's supporters. The crackdown has expanded to threaten essentially all critics of the government. "The government's brutal crackdown on dissent shows no sign of stopping, with enforced disappearances and torture becoming a matter of state policy," Philip Luther, Amnesty International's Middle East and North Africa Director, said in a statement. "Egypt needs these critical voices more than ever." As NPR's Leila Fadel has reported, "many activists in Egypt say the country is going through the most repressive time in its modern history."